The plantar fascia, is a sheet of connective tissue that spans the underside of your foot, from the heel to the ball of the foot. During running, walking and jumping, your calves pull up on your Achilles tendon, which transmits force through the heel and plantar fascia to the ball of your foot, propelling you forward. Structurally, this fascia helps support the arches of the foot and is often the last line of defense when that inner arch beings to fall. 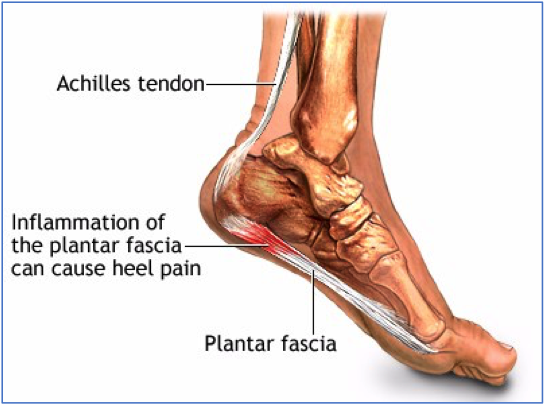 Plantar Fasciitis, is injury to this connective tissue and often feels like a sharp/ burning pain where the inner arch meets the heel. The pain is usually worse after long periods of sitting or during the first steps of the morning but can also become very achy during and after long bouts of time on your feet. The main causes are poor footwear (unsupported arch), sudden increase in impact or mileage, sudden gain in body weight, and chronically tight calves. Other factors include tight glutes, tight hip flexors, lack of pelvic stability, and lack of big toe extension, which will alter the mechanics at the foot. Basically, poor movement pattern or increases in load or force through the arch will tax the tissue and may injure the supportive fascia. Find neutral: Choose footwear that keeps your ankle in a neutral position. Adding an arch support tape job can also help keep you moving pain-free! Warm-up: After long periods of sitting or before getting up in the morning, do 20 toe crunches to warm-up that arch. Pain management: A frozen water bottle under the foot can help numb the area and manage pain. Try to avoid pushing the foot against the bottle and grinding the already compromised tissue. Promote healing: Using a tennis ball, compress and release the ball of the foot at the inside, outside and heel. Repeat 10 times at each spot using a pain-free pressure. This promotes circulation and healing while avoiding creating more length in a tissue that is already too long and chronically strained. “How To” video link! Seek help: Plantar fasciitis is often caused by more than one reason. If none of the above seems to be working, then it’s time to contact a rehab professional like a Physiotherapist or Athletic Therapist to get to the root of the problem!